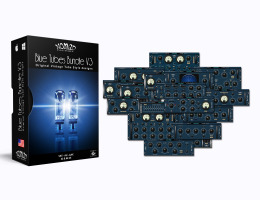 The Blue Tubes Bundle V3 is a collection of 19 plug-ins processors for PC and Mac OSX. It recreates the warm sound qualities of classic analog hardware. The sound quality of Blue Tubes is nothing short of amazing. Yet all 19 plug-ins provide a simple and functional vintage-style interface, as well as very low CPU consumption for lightening-fast processing. Keeping up with the previous versions of top quality audio process plug-ins, the Blue Tubes Bundle V3 has been totally redesigned in order to offer even more great features enhancing your digital sound recordings.